Howdy Beer is made with Montana-grown barley malt and Palisade hops. Well, hello there, Howdy! Despite calling yourself “The All-American Pilsener,” you’re not like all the industrial American pale lagers I’ve come across. Oh, sure, you slide down the throat just as easily. And you are equally quaffable and crisp. 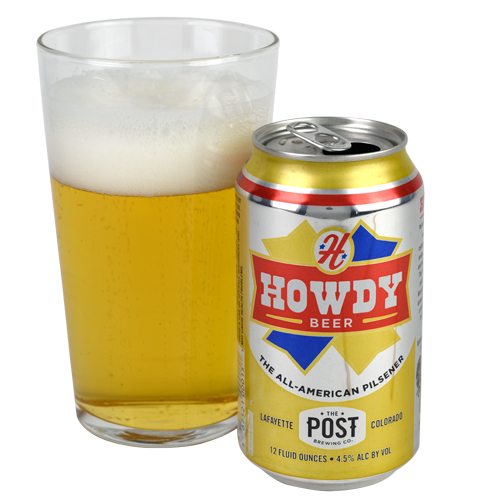 But here’s what makes Howdy stand out: The malt—softly bready with a grainy sweetness. And the hops are definitely more present—slightly grassy with some herbal notes and a touch of spice—shining brightly and lingering just long enough to encourage me to take more sips. This is the kind of beer you want to join you all summer long. As the beer pours from the cool retro-designed can (does this come as a cowboy shirt? ), the white foam rises and holds steady like a boss. The beer is clear gold, if not quite bright. The aroma is soft and grainy, with some floral notes phoning it in from a distance. The bitterness is moderate and a bit brassy, as if perhaps the local water carried some minerals in tow. A quick snap and it’s gone, leaving just a little bitterness hanging. A fine beer for when that’s just what you want, and it surely has more flavor than you’ll see from industrial counterparts. Chili dog? Sure … I love chili dogs.